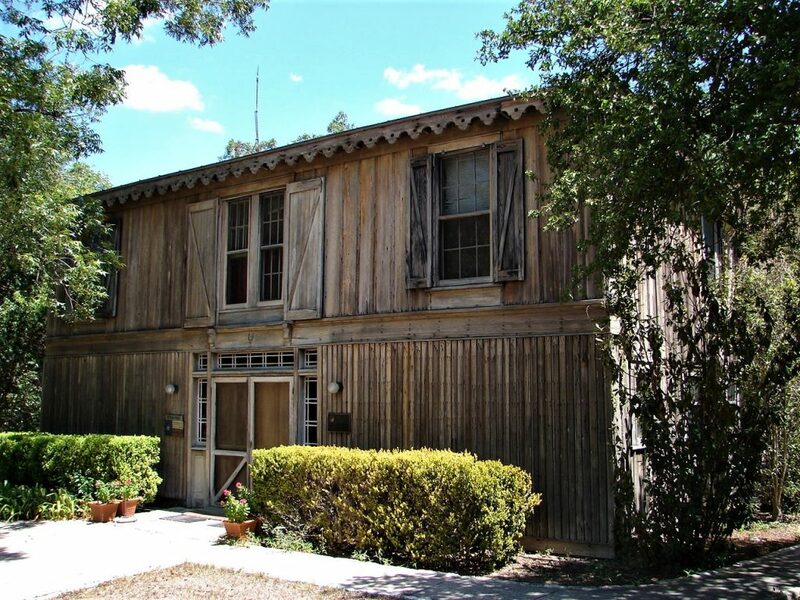 The San Antonio Conservation Society purchased its first piece of historic property in 1926. For the sum of $50, the ladies acquired a door to the Mission San Jose Granary to preserve the brass medallions on it, which the building’s caretaker had been removing and selling to tourists. Since then, the Society has purchased and preserved 30 historic buildings. Today, we own and maintain 17 historic buildings on seven different properties. Use the buttons below to browse their histories. The national preservation lobbying organization, Preservation Action, was founded on this site on March 23, 1974. The building underwent extensive structural repair in 1978 and again in 1995. 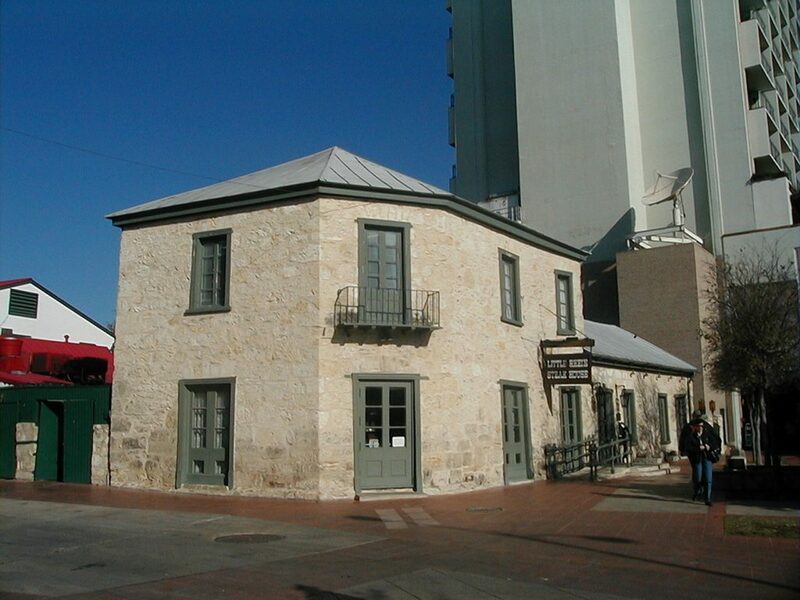 From 1975 to 2004, the Dashiell House served as the headquarters for a Night in Old San Antonio. 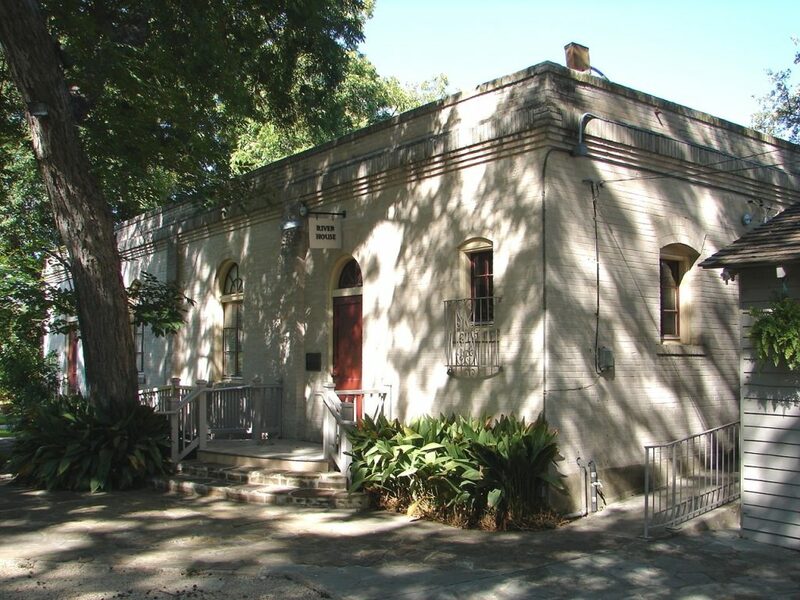 When the NIOSA offices moved to the Gresser House on South Presa Street, the Society chose to rent the Dashiell House to the Fig Tree restaurant, while retaining use of the garden overlooking the river for several Society events. 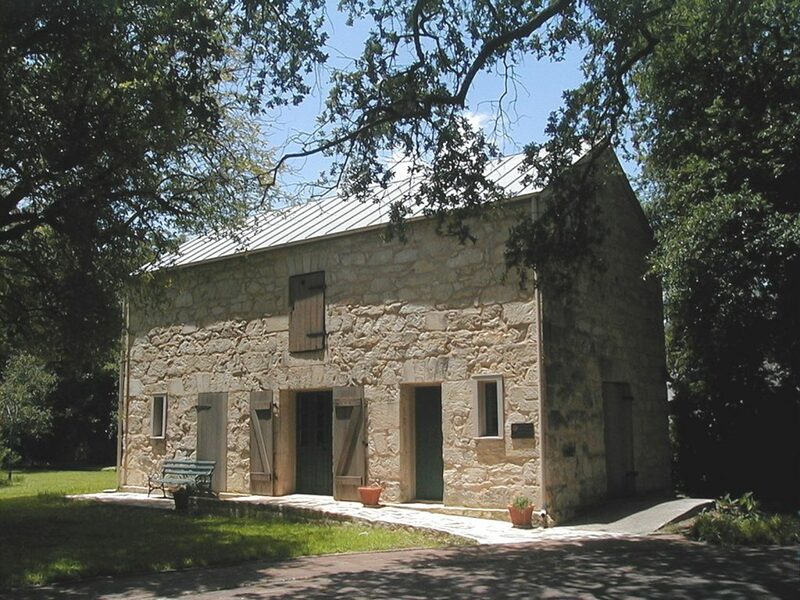 Located on the banks of the San Antonio River in the La Villita Historic District, this one-story limestone house was built for Major Jeremiah Dashiell by San Antonio contractor and stonemason J.H. Kampmann, circa 1850. 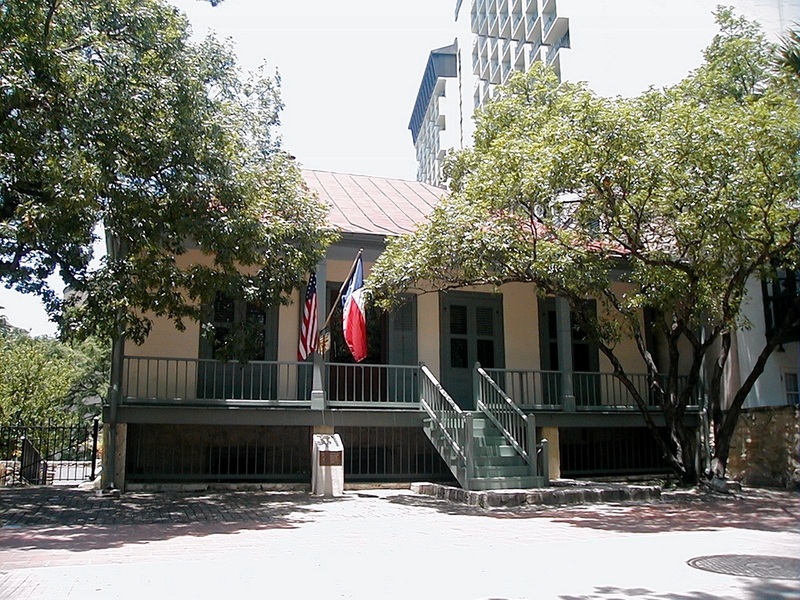 The San Antonio Conservation Society purchased the house in 1942, restored it, and used it as headquarters until 1975 when its offices moved to the Anton Wulff House. On April 6, 1998, the Society purchased the former Alaskan Palace property at 102-106 Navarro Street from the Tschirhart family. Koch’s Bird’s Eye View Map of 1873 showed two buildings on this site which backed to Louis Gresser’s property on S. Presa Street. The main structure was a house divided in the middle, with a small cottage or kitchen to the rear. The current building façade was built between 1940 and 1945 when the Deason Radio Company occupied the southern portion of the building. The Society completed the rehabilitation of the exterior of the building to its 1940s appearance in 2006. Subsequent interior renovations included the creation of a commercial kitchen in 2010 and the finish out of the rest of the building for lease. 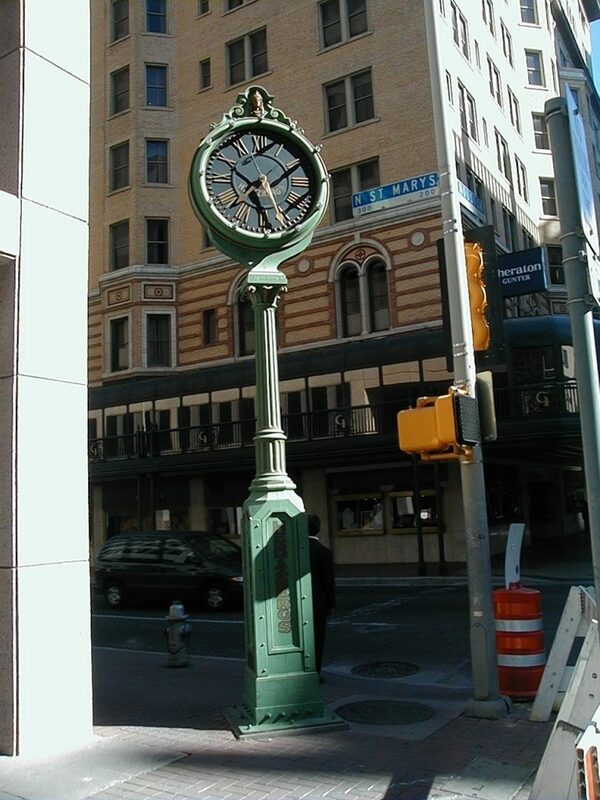 This San Antonio Conservation Society Foundation property has been a landmark for generations of San Antonians, who would “meet you at the clock.” Cast in iron by E. Howard Clock Company of Boston, it was first installed in front of Eli Hertzberg Jewelry Company on Commerce Street in 1878. In 1910, the company – and its clock – moved to the corner of St. Mary’s and Houston Streets. When Zales purchased the company in 1964, the store relocated to suburbia, leaving the clock behind. In 1982, Mrs. Thomas C. Bordelon and Mrs. Jesse B. Poston, daughters of long-time Hertzberg owners Max and Nell Goodman, donated the clock to the Conservation Society Foundation in their parents’ memory. Through the generosity of the Republic Bank San Antonio; London Watch and Clock Company; and Kurt Voss Metals, Inc., the clock was restored. The clock is unusual in that it continues to be hand wound rather than electrically driven. International Bank of Commerce now maintains the clock for the Society. Louis Gresser purchased property with a small house at the corner of Presa and Nueva Streets from Maria Concepcion Gonzales y Casas for $1,000 in 1861. 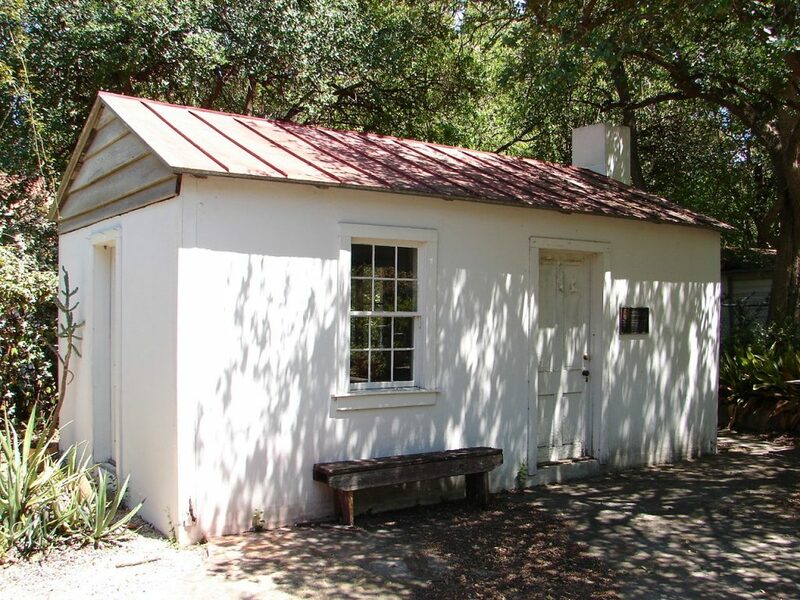 The Gressers built several structures on the property, including a house adjoining the original Casas House on Presa Street. These two structures appear on Koch’s 1873 Bird’s Eye View Map of San Antonio. 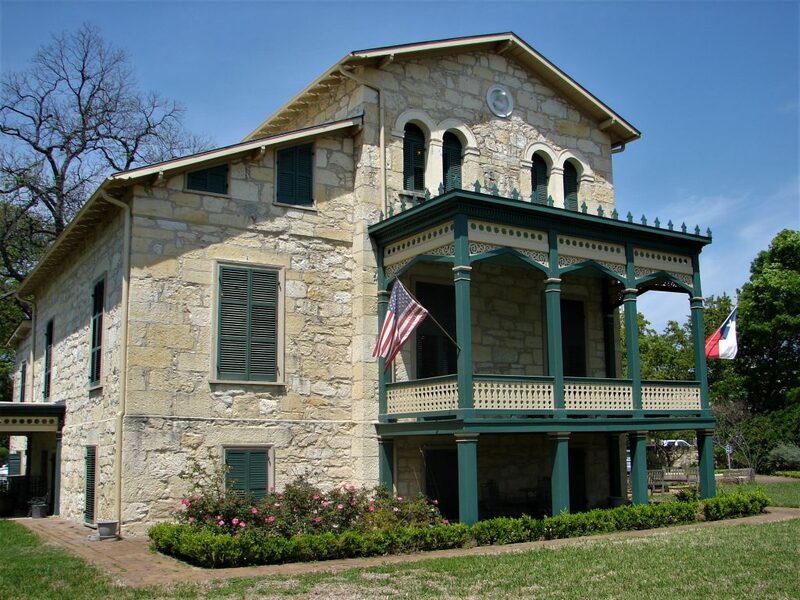 According to legend, the famous Texas Ranger, Colonel John Coffee “Jack” Hays, once lived on the property which passed from the Gressers to the Foutrels, and finally, to the Tschirhart family. 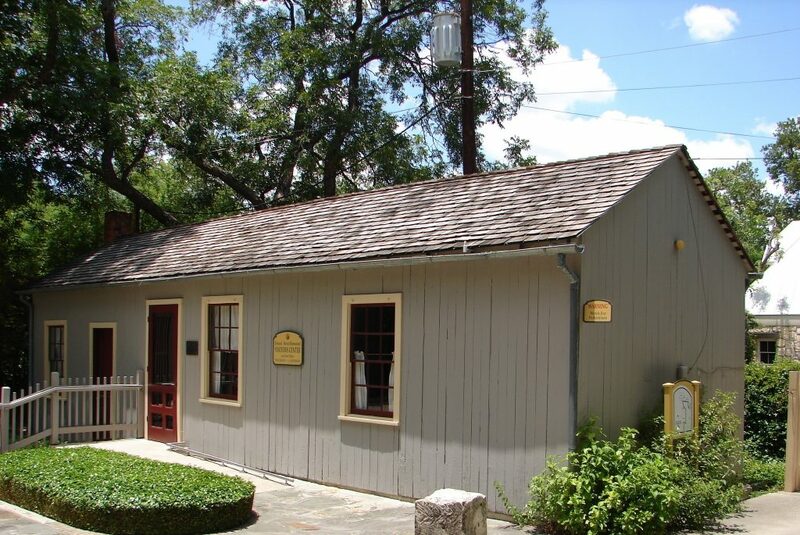 The San Antonio Conservation Society purchased this building in the La Villita Historic District from the Tschirharts in April of 1976 and completed restoration the following year. The house has four rooms across the front, each room with a door to the porch. It now serves as the office for A Night in Old San Antonio®. 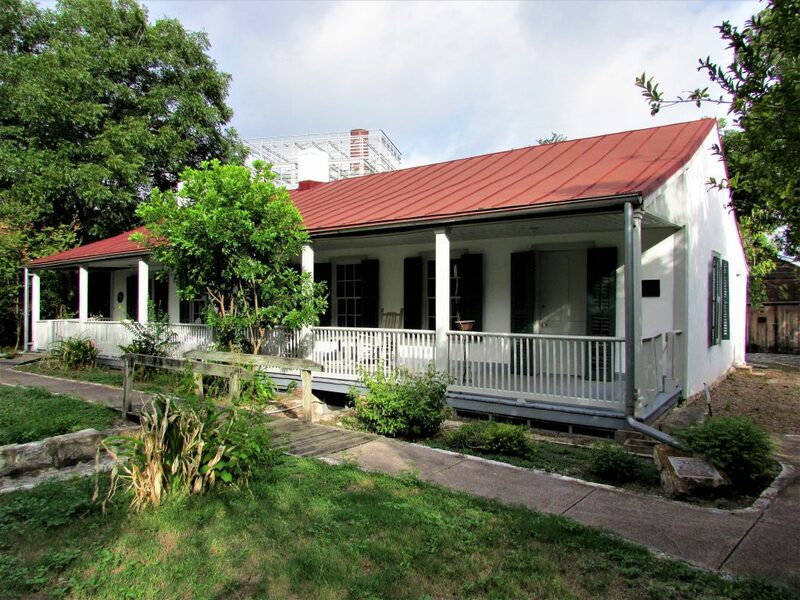 Built in 1881, the carriage house was purchased by the Society and moved from its original location on the Oge property in the King William Historic District in 1964. The exterior of the two-story board-and-batten building was restored to its original appearance. The ground floor of the interior was modified for use as a meeting room and an apartment was created on the second floor. Otto Bombach built this one and two-story rubble limestone structure for use as a residence and store, circa 1855. For the majority of its existence, the building housed a restaurant or pub. When the Society purchased the Bombach property in 1950, the restoration process revealed the existence of a basement – an unusual feature for San Antonio buildings. 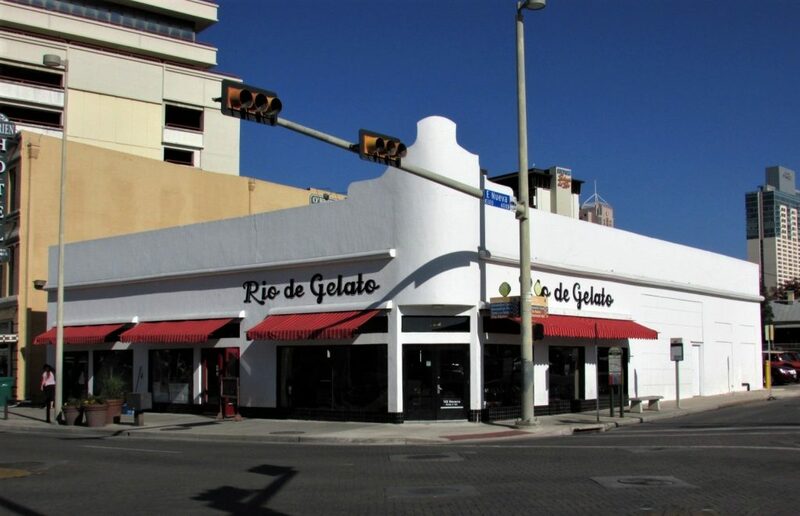 Located at the east end of the La Villita Historic District and occupying the river’s “big bend,” the property is presently leased to Phelps-King Corporation for use as the Little Rhein Steak House. Cristof Postert built this small caliche block and stone rubble house at 1604 South Flores Street around 1855. When the house was threatened by demolition in 1984, Mr. Felix Eckert donated it to the San Antonio Conservation Society Foundation. Through the generosity of Society member Floy Fontaine Jordan, the Society moved the house to its present location just behind the Oge carriage house on the Yturri-Edmunds property. Mrs. Jordan dedicated the relocated structure to the memory of her grandfather, Frank Mudge Edwards, who was present at the founding of the Society in 1924. Built in 1875, this two-story frame and stone building stands on the east bank of the San Antonio River adjacent to the River House. 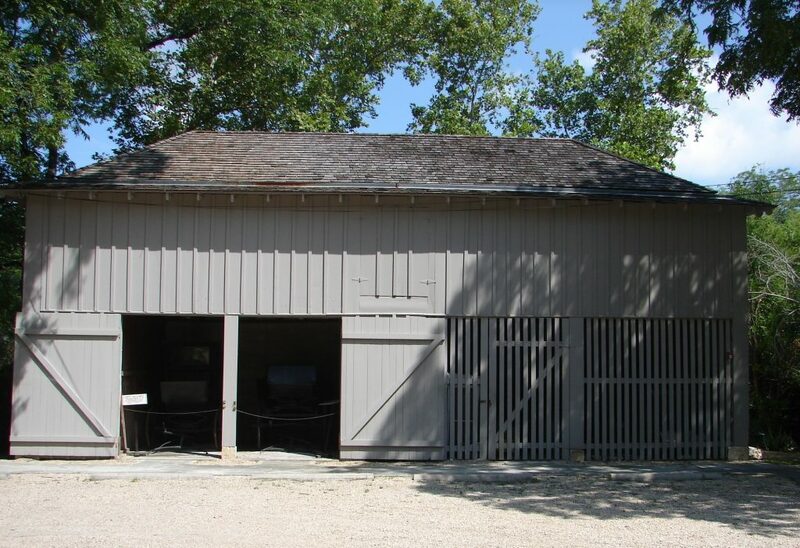 Before its use as a carriage house, the building provided storage during construction of the Steves Homestead. 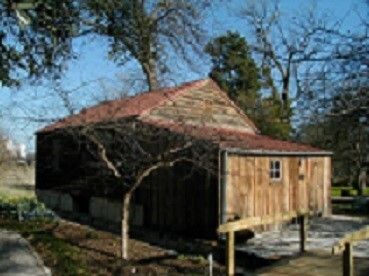 Restoration of the carriage house began in August 1976. The work was completed in November 1977 with a matching grant from the U.S. Department of the Interior administered by the Texas Historical Commission. Today, the carriage house displays two antique carriages of the type that might have been used by the Steves and their neighbors. 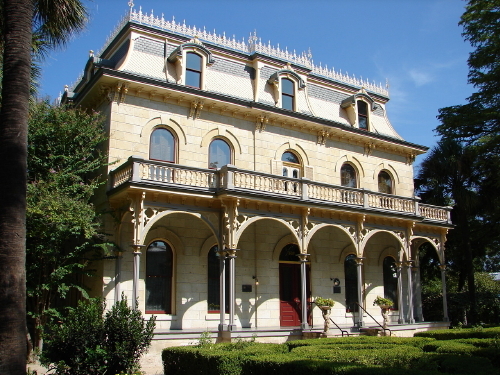 Located on the east bank of the San Antonio River in the King William Historic District, this elegant three-story residence was built in 1876 for Edward Steves, founder of the Steves Lumber Company. The ashlar limestone structure, constructed in the French Second Empire style, features a concave mansard roof with decorative iron cresting. Alfred Giles, a prominent San Antonio architect, is thought to have been its designer. In 1952, Mr. and Mrs. Curtis Vaughan donated the property to the San Antonio Conservation Society Foundation in memory of Mrs. Vaughan’s grandparents, Mr. and Mrs. Edward Steves, and her parents, Mr. and Mrs. Albert Steves. The Society has maintained the Steves Homestead as a house museum since 1954. It is open daily for tours. This one-story brick structure located at the rear of the Steves Homestead property housed the first natatorium, or indoor swimming pool, in San Antonio. An artesian well supplied water for the brick-lined pool. According to local tradition, Mrs. Steves swam every day at two o’clock no matter what the temperature. Flooring has been laid over the pool and the interior has been modified to provide a meeting room for Society activities. This frame building, constructed around 1877, housed the gardener and the stable boy. The Society restored the servants’ quarters in 1983-84, with the help of a grant from the Texas Historical Commission. The building now serves as a visitor center for the Steves Homestead house museum. In 1982, the Society acquired the endangered Stuemke Barn from Frost Bank, which owned the barn and the land it was built on at 215 North Flores Street. The bank also provided a donation to finance the move of the mid-nineteenth century barn to the Wulff House grounds at 107 King William Street. Curtis Hunt Jr., a master stonemason, dismantled the two-story, native limestone structure, numbering and photographing each stone to ensure that the barn would be reconstructed accurately. Today, the Stuemke Barn provides the Society with additional office space. 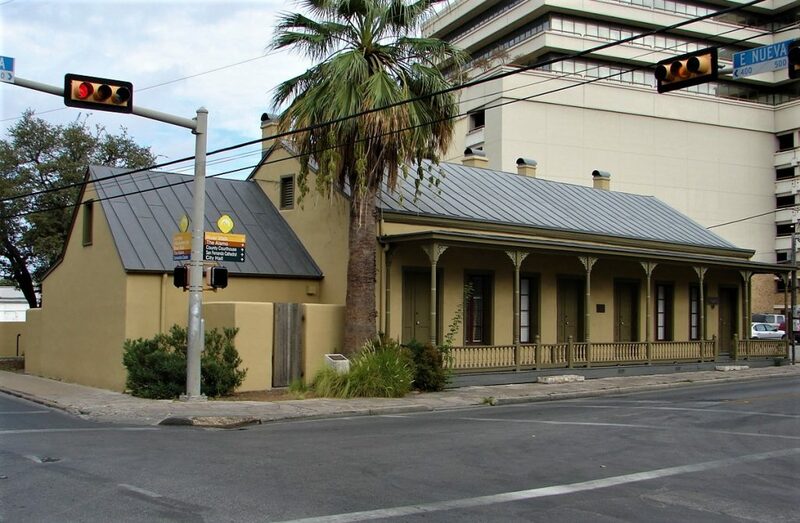 The Society uses the property as its headquarters, with the San Antonio Conservation Society Foundation Library located on the third floor.The Wulff House, built by German immigrant Anton Wulff c. 1870, stands at the entrance to King William Street. The three-story, Italianate style house features random coursed ashlar limestone walls, a distinctive tower room, and a raised basement. Wulff, who came to Texas in 1848 and settled in San Antonio in the 1850’s, became a prominent local merchant, as well as an alderman, and the city’s first parks commissioner. After a series of owners, the Wulff House fell into disrepair and was slated for demolition when the Conservation Society purchased it in June 1974. Sparked by a $100,000 grant from the Sheerin Foundation, the Society undertook a campaign, led by Walter Nold Mathis, to raise matching funds to purchase of the building for $200,000. The restoration cost more than $250,000, eighty percent of which came from a U.S. Economic Development Administration grant and twenty percent from funds raised by the Society. The Wulff House became the second historic structure, after the Ursuline Academy property in 1974, to receive this type of federal funding for restoration purposes. Restoration of the house was completed in the fall of 1975. A 1979 gift from Mrs. Sam Maddox enabled the Foundation to reproduce the iron fence that had originally surrounded the property. The Society accepted the iron rose arbor from the Cable House property as a gift from the Southwest Research Foundation in 1980. Miss Ernestine E. Edmunds, granddaughter of Manuel Yturri Castillo, willed this two-third acre tract to the Society, which took possession of the property in December 1961. Yturri Castillo had received the land grant, originally part of Mission Concepcion lands, in 1824 from the Mexican Government. Built between 1840 and 1860, the house is one of the few adobe-block houses remaining in San Antonio. North rooms of the structure span a lateral from the Pajalache acequia, a notable and unusual feature. Long range restoration of the property began in June 1964 under the direction of Ernst Schuchard, well-known engineer and former executive of Pioneer Flour Mills, and the late Marvin Eickenroht, A.I.A., who was the project architect. The house was recorded in the 1969 Historic American Buildings Survey. Guided tours are now available – for more information, please visit the Yturri-Edmunds main page. There has been much conjecture about the origin of the mill. Some researchers speculate that it already existed on the property when Manuel Yturri Castillo acquired the land in 1824. However, Yturri Castillo did not mention the building in his will of 1842 and attempts to document the dates of operation have proved unsuccessful. An adobe brick wall and stone steps are all that remain of the original mill; the rest has been reconstructed. Long range restoration of the mill began in June 1964 under the direction of Ernst Schuchard, well-known engineer and former executive of Pioneer Flour Mills, and architect Marvin Eickenroht, A.I.A. The reconstruction was completed in May 1972 with the cooperation and supervision of Alfred Beckmann and E.W. Dotson of Pioneer Flour Mills; Ambrose A. Kozielski, millwright; and Robert Borrego, Jr., millstone craftsman.